This is a preview that I wrote in June 2011 for the free-to-play MMO Kitsu Saga as a writing sample for a job I didn’t get. Nevertheless, I like it, so I’m posting it. It was announced in July by Kitsu Saga creators Aeria Games that they were shutting down operations of the game. Even though I never made good on my promise to check out Kitsu Saga more thoroughly, I had planned to get to it eventually. Of course since the shut-down happened one short month after I discovered the game, it probably wouldn’t have mattered. Regardless, Kitsu Saga, unremarkable as it was, had some solid ideas behind it and I’m bummed that I’ll never get to investigate those concepts more thoroughly. Oh well. 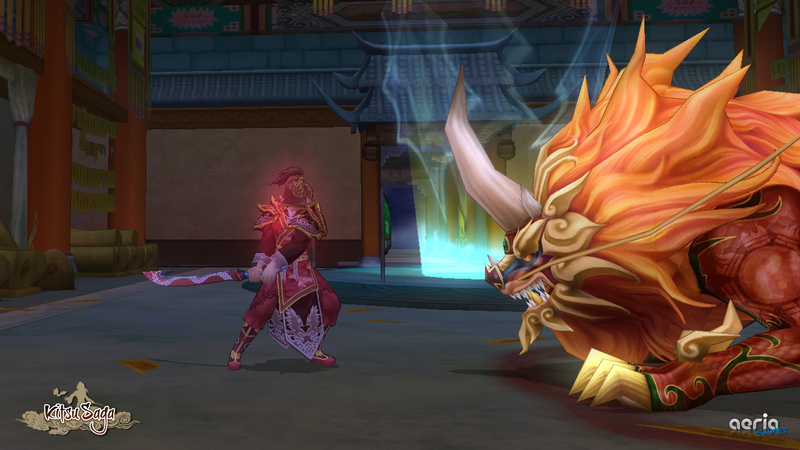 Funny thing about free-to-play, anime-themed Asian MMOs — I don’t play them. But other people do. Why? These sorts of games always seem so horridly grind-y, so diabetes-inducing in their colorful, marshmallow-coated palettes…. (Also I had writer’s block and this seemed like a good way to shock-therapy my lazy muse into workhorse-like submission). First up is to choose a faction: Blue Tiger or Red Dragon (actually the Order of the Iron Claw and the Flamewind Society, respectively), each with their own unique classes. I choose the red guys, because they’re description seems in line with my chaotic-good ways. Looking at their classes, I see an obvious tank, an obvious healer, a couple of sword guys. Hmm, I wonder what the blue team has to offer. OH – MY – GOD. There’s a class called Mistsong. It wears pink and gold armour with big flowers on the shoulders. It uses the power of opera (OPERA!) 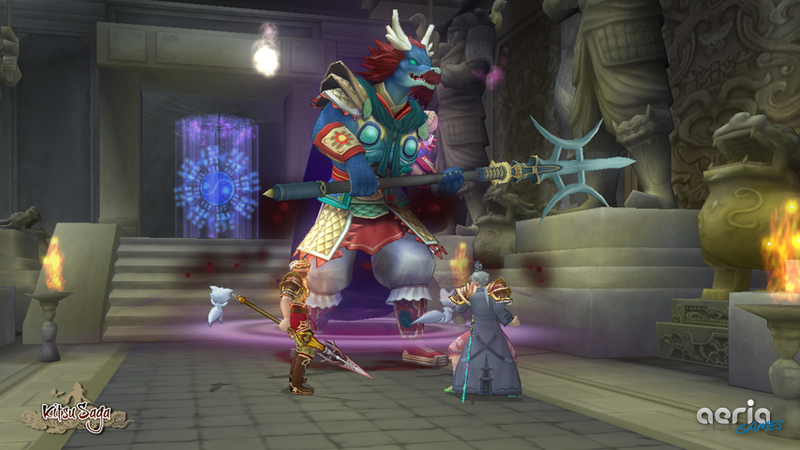 to change into different mythological figures like… the Monkey King?! Tears of joy. Cynicism banished. All this game needs is a unicorn mount and it will be my personal Greatest of All the Time. I make a dark-skinned, aqua-haired, lazy-eyed opera singer/shape-shifter and jump in. In-game, Kitsu Saga is pretty much what I expected: hubs, quests, mobs, and the video settings in here make a lot more sense. The tutorial explains a lot of things I already understand from other MMOs, except Kitsu Saga includes a handy “Helper” feature that can automate lots of the more menial MMO stuff, like using potions and selling items. 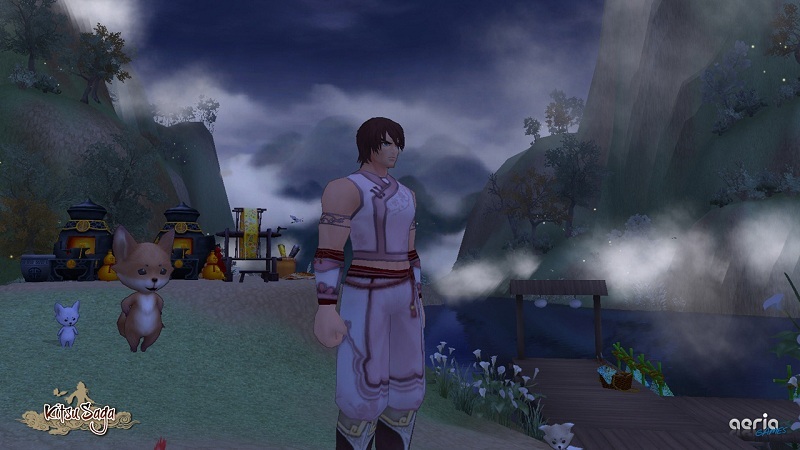 In my cynicism I wouldn’t have expected Kitsu Saga to do something mainstream MMOs should do but don’t, but it does. Color me impressed. I only got as far as the first quest and earning my first Kitsu, but I’ll be back. I can’t promise that I’ll see Kitsu Saga to the end-game, but I’ll be investigating it some more, that’s for true.